Due to rapid urbanization and industrial development, air pollution has become a major environmental issue in China. As of today, more than 120 cities have populations of more than one million, and by the end of the twenty-first century, 10 to 20 cities will have populations of more than 10 million. Although conditions have improved in modern cities, such as Beijing and Shanghai, China still has three of the ten most polluted cities in the world and hundreds of cities that are not in compliance with the World Health Organization (WHO) air quality guidelines. The MAXDOAS instrument at Beijing (June 2008 - April 2009). Within the context of the Sino-Belgian R&D cooperation, BIRA-IASB has concluded an agreement for joint scientific research activities with the Institute of Atmospheric Physics of the Chinese Academy of Sciences (IAP/CAS). 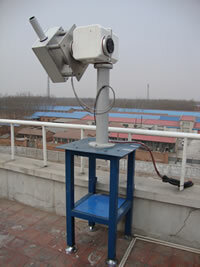 This collaboration materialized with the setting up and operation of an advanced system for the remote sensing monitoring of air quality in Beijing based the MAXDOAS technique. On the 21st of June 2008, the instrument funded by the Belgian Science Policy and developed at BIRA-IASB has been installed on the roof of the IAP/CAS building, at walking distance from the Olympic stadium. It has been operated for an initial period of 10 months, after which the suitability of the site for longer term monitoring have been re-evaluated. 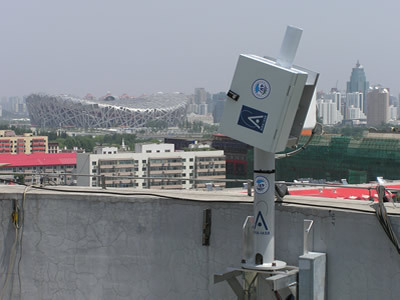 The MAXDOAS measurements in Beijing contribute to the objectives of the EC FP6 project Air Quality Monitoring and Forecasting in China (AMFIC) which addresses air quality monitoring and forecasting in China based on satellite observations, in situ measurements and modelling. In February 2010, the MAXDOAS has been definitely installed at the top of the LAGEO Institute in Xianghe (39.75°N, 117°E), located about 60 km east of Beijing. The BIRA-IASB MAXDOAS instrument is a full automated dual-channel system. It consists in a thermo-regulated box containing two spectrometers located inside the Institute building. An optical head is mounted on a commercial suntracker located outside and connected to the spectrometers via optical fibers. The optical head design is such that the telescope can be moved in a wide range of elevation (0-90°) as well as azimuth directions (0-360°). This set-up enables not only scattered light, but also direct-sun measurements. Data are available on request. Please, contact Michel Van Roozendael.